View of Brisbane from Mt. Coot-tha's summit. 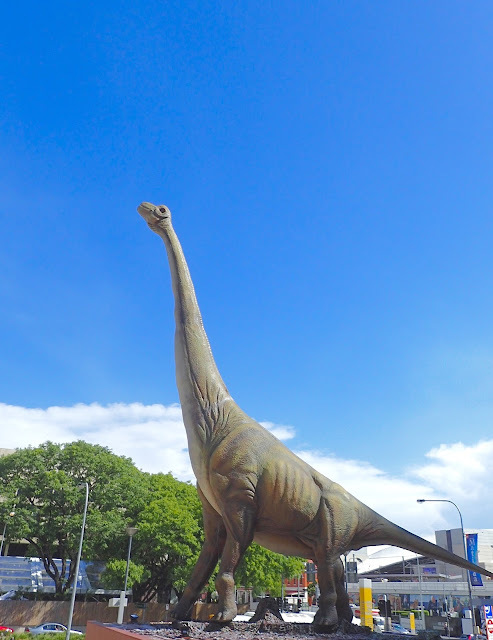 Brisbane, Australia is more snidely nicknamed "Bris-Vegas." Given that, we really didn't expect to like it. Yet we did like Brisbane - a lot! 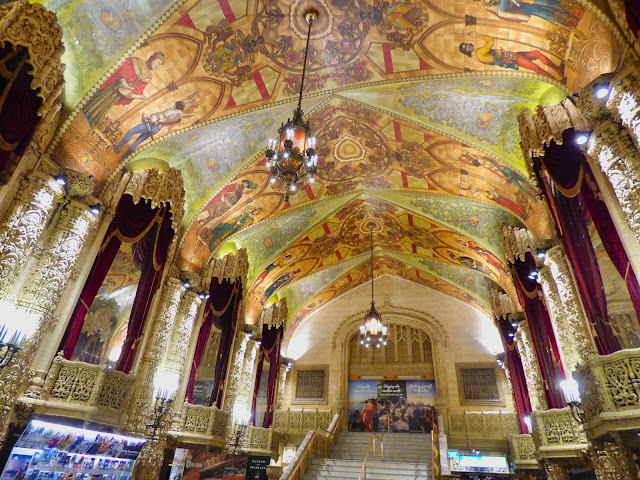 Maybe because in many ways, Brisbane felt like "home" --Portland Oregon's sub-tropical doppelganger. Brisbane like Portland is a river city. Bonus! 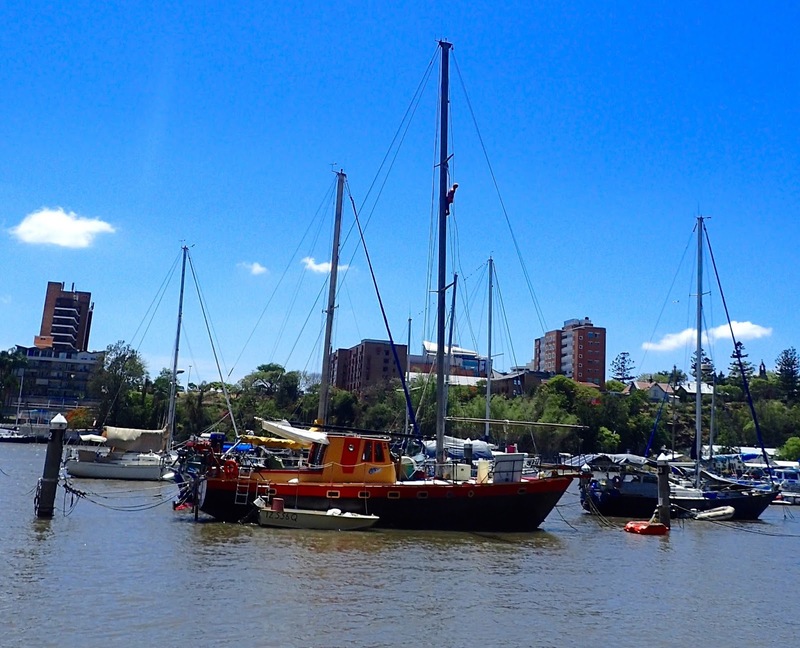 For visiting yachties, you can grab a pole mooring in the heart of downtown Brisbane for a pittance - $70 AUD/week. We are kicking ourselves for not tying off there. We were there for a very short time, and were concerned about riding the current in and finding nothing available. We found out after we took the train in from Manly* there was plenty of space available, and some room to anchor if not. Note: expect river traffic to make the anchorage rolly, so if that's a big issue for you, consider opting out of this otherwise happening spot. Brisbane's affordable pole moorings, in the heart of the city. 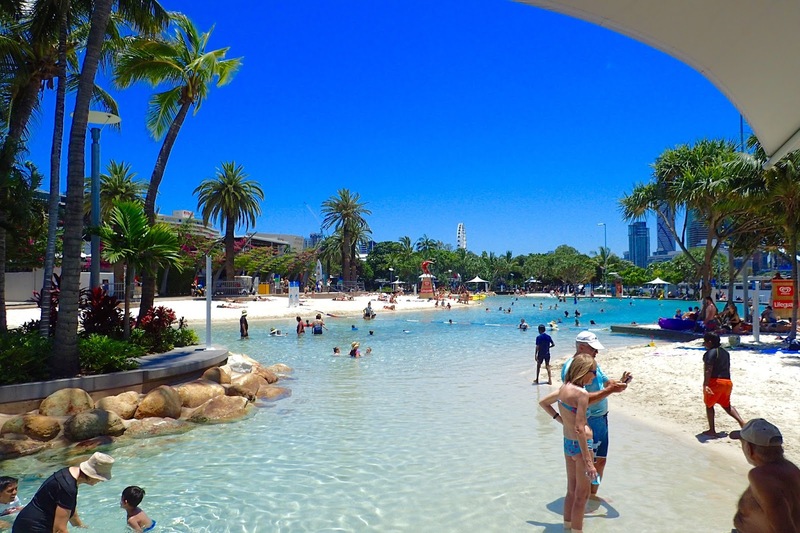 Brisbane's Streets Beach park. Fun for all in the heart of the city. Kinda like Portland's waterfront park fountains. Well, not quite! 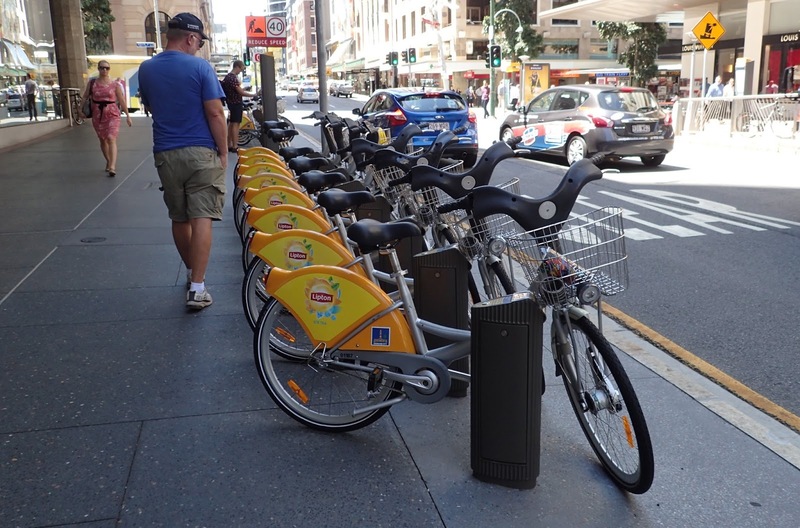 Rental bikes, downtown Brisbane Australia. Look a lot like the orange ones in Portland, OR. 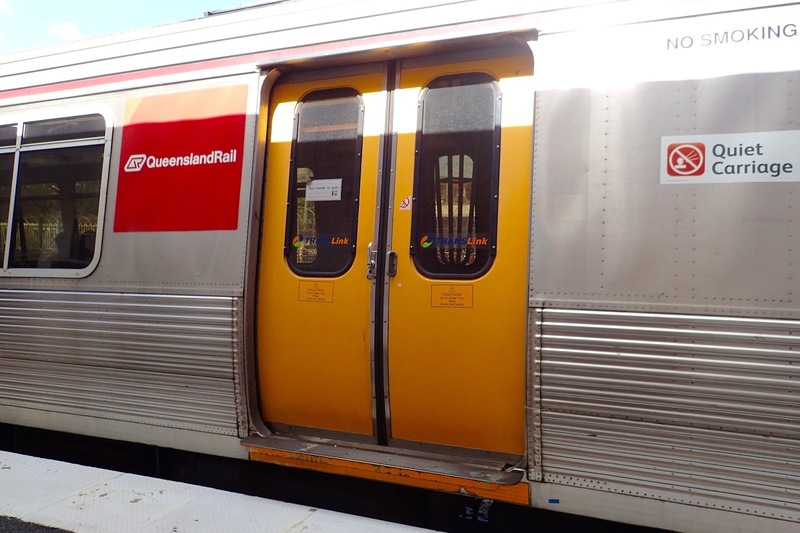 We're fans of mass transit; Brisbane's is pretty good! This is the train we took from Manly to downtown Brisbane. *Most cost-effective way to get to Brisbane from Manly is to take the train. The helpful ticket agent at the train station advised us to buy a pass. They will buy it back, so the extra outlay for it is not that big a deal. Manly, Brisbane Australia -- where we docked Journey for two days in November. 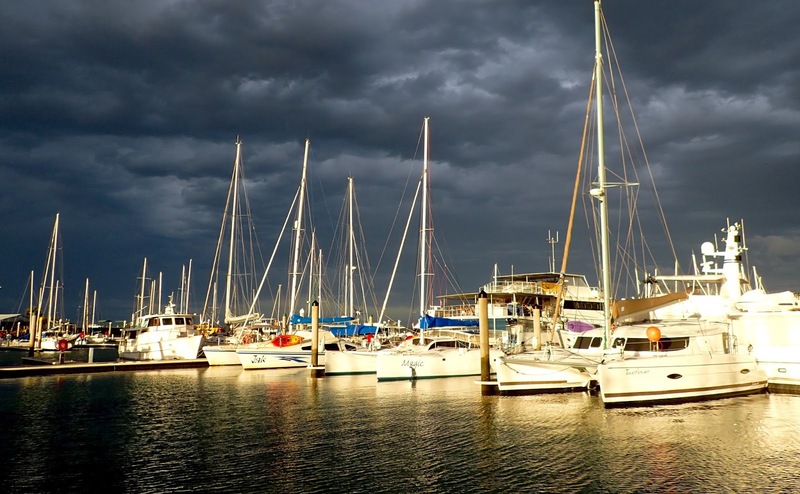 Queensland's lightening storms got our attention. These dramatic clouds harbored equally dramatic lightening. We do know Brisbane gets outrageously hot. Apparently the weather gods were kind on our visit, though the lightening storms, common in the Queensland territory in the summertime, definitely got our attention. 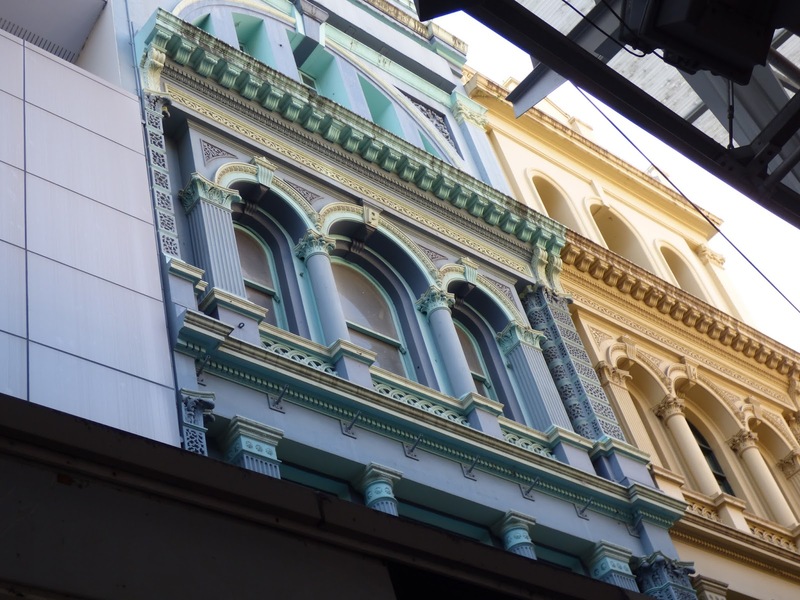 Like Portland, Brisbane's retained much of its classic architecture, too. What we'll remember most about Brisbane is Helene and Steve's generosity -- twice -- when we first arrived in Brisbane, and again in putting us up for over a week as we got our stuff together when we were about to leave the country. They even connected us with a buyer for our Landcruiser, our last big responsibility before leaving Australia. Of all the cities we visited in Australia Brisbane is is pretty high on our short list of places we'd choose to live. Given that, there's a certain sweetness to making Brisbane our last stop before heading to it's unofficial sister-city in our mind, Portland, Oregon. Currently staying with Wayne's folks in Portland OR, on the Columbia River. From 2012 - 2017, we traveled through 30 countries in our small sailboat, logging over 18,000 ocean miles. We recently sold our boat in Australia. We are currently in Portland Oregon. Home will be where we can land living-wage jobs in a place we like. We're not yet sure where that will be, though for now, it will be somewhere in the US. Portland or Brisbane? What's your best guess? In between job hunting and catching up with friends, there will be continued blog posts to fill in some gaps on our travels, improve ease-of-search as well as occasional "re-entry" posts.